I’m not about to start experimenting with making perfume anytime soon but I ran across a book on this very subject recently which I thought was very interesting. 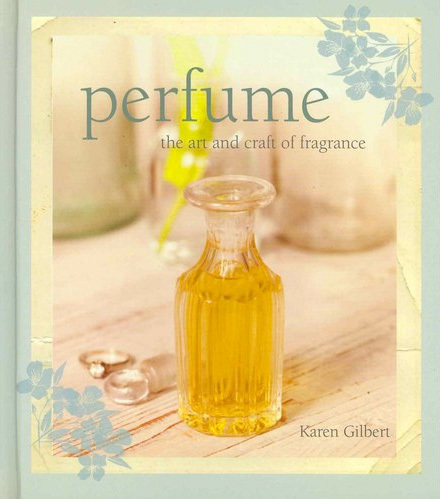 Karen Gilbert’s “Perfume : the art and craft of fragrance” is a starter book about how to make your own perfume but it also includes some very factual and concise information about the psychology of smell, perfume history, and its classification. It made me perk up and realize that Ms. Gilbert knows what she’s talking about and the more I read, the more I was interested. “Perfume : the art and craft of fragrance” is very easy to read with its pretty pastel colours and soft-focused photography but don’t get fooled, you’ll get some really hard data here as well. For instance, here is some text regarding rose notes. As for making perfumes, I get asked that question quite a lot after my perfume lectures. People ask me if I’m a nose, which I am not, and some ask me if I have ever considered making my own perfume. To be honest, I don’t think I have the patience, and I’m much more into the history and classification of perfume anyway, but I think this book could be a nice holiday gift for someone who wants to learn about perfume and perhaps discover a new hobby. The text is extremely well written and the book is a good overview – from perfume sprays and solids to bath and body products to home fragrances. In fact, there is so much here, I think for a lot of readers this just might be the only book on making perfume they will ever need. If you’re running around for a last-minute gift, this is a good bet. I have no interest in making my own perfume either, but it looks like a nice book. Sonoma Scent Studio has a good interview with a distiller of perfume ingredients today, very interesting discussion of the different methods. It’s a great overview book. In the short history section Ms. Gilbert gets all the important milestones while making connections to the fashion and social issues of the day. For the beginner, it would be a great primer. I didn’t try any of the recipes but I enjoyed reading the ingredients and imagining what that would smell like. Thanks for the comment and the heads-up. J’ai appris sans avoir lu le livre. Merci Normand! Et en passant, le nouveau design de ton blogue est magnifique. I am not interested in making perfume but this book sounds nice. I think this is a good gift for this Christmas. It looks like a lovely book…. but to make my own…. hmmmm. Don’t think so. There are too many lovely fragrances out there. I agree! But for a do-it-yourselfer, it would be fun. The recipes look very interesting. I had the opportunity to meet Karen recently, and she definitely knows what she’s talking about; she has the combination of training and industry experience that I think is somewhat rare among people who write books like these. I haven’t picked it up because, like you, I’m not interested in making my one fragrances, but I flicked through it and agree on the quality of the information (from what I saw in that glance). Because the industry is so secretive, insider information is so rare! I agree with you on Karen’s credentials. Hi Normand, thanks for the info… I will definitely take a look at this book! Thanks for writing! Merry Christmas and Happy New Year to you, too! Thanks… I needed a change!